Many people believe that a decline in memory and mental processes is inevitable as we age. Indeed, scientists haven’t yet figured out how to prevent dementia and its precursor, mild cognitive impairment. But loss of mental abilities is by no means inevitable – and research points to several behaviors that can reduce the risk of developing cognitive impairment. Studies such as the 2-year Finnish Geriatric Intervention Study to Prevent Cognitive Impairment and Disability (or “FINGER” study) have found that together, four key behaviors can significantly slow cognitive decline. Here’s how to incorporate those factors to help your aging loved ones stay sharp into the golden years. Nutrition: What’s good for the body is good for the brain. Diets that keep hearts healthy may also reduce the risk of dementia. Nutritionists recommend diets low in red meat and saturated fats, and rich in fruits, vegetables, nuts and whole grains. Disease management: Research shows that carefully monitoring and managing heart disease and metabolic diseases, such as diabetes, is important for protecting brain health. Eating right and exercising regularly will help keep such diseases under control, but some people need extra help. Encourage your loved ones to talk to their doctors to make sure their blood pressure, cholesterol and other heart risk factors are kept in check. Cognitive exercise and social engagement: Brains need exercise too. Challenging mental tasks such as learning to play an instrument or taking online university courses can help keep your mind active and healthy. Social connection is also important for protecting brain function. Clubs and group activities can help ensure older adults are enjoying social engagement on a regular basis. Unfortunately, older adults can sometimes have trouble incorporating these behaviors into their routines. Without help, seniors can have trouble preparing nutritious meals or staying active. They may become isolated and miss out on the benefits of social connection. Nutrition: Our restaurant-style dining offers a variety of nutritious and delicious options for breakfast, lunch and dinner. Physical activity: We offer group exercise classes and have beautifully landscaped courtyards great for taking walks with friends. Disease management: Our caregivers help manage medications, while our transportation services make sure residents get to their doctor’s appointments. Cognitive exercise and social engagement: Heritage Communities offers dozens of activities to keep residents mentally engaged, from book club to pool league. 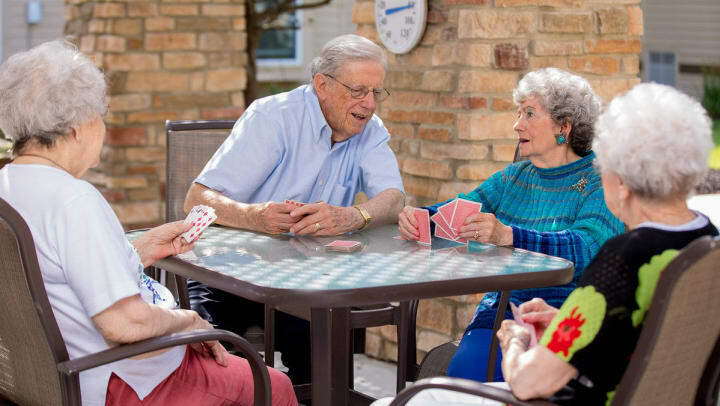 Our residences truly are communities, where people regularly dine with friends, join their peers for bingo or field trips, and socialize with one another in all sorts of fun and engaging ways. Heritage Communities puts together all the pieces of the senior health puzzle, so that our residents can remain independent as long as possible. Ready to learn more? Find a community in your area.